Removing homeless camps from Seattle sidewalks and parks and near roadways is a move in the right direction as long as the result is more people getting help and a safe place to sleep. 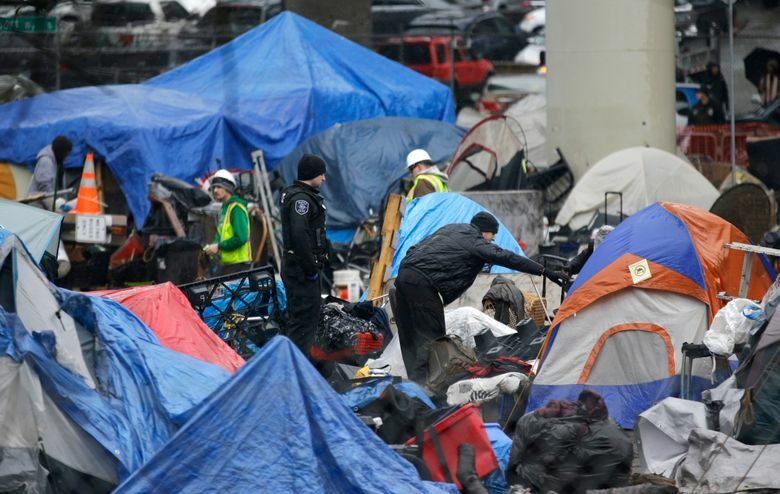 Since February, 411 homeless encampments have been cleared off Seattle sidewalks and other places that pose a health or safety risk for people inside and outside of the tents. That’s good news, because more people are also being housed and their needs addressed. Clearing homeless camps is just one part of addressing Seattle’s homelessness issues. The problem is complex and requires progress in a number of areas simultaneously. People with more complex problems, like addiction or mental illness, need faster referrals into treatment and supportive housing. Single adults in low-barrier shelters need help finding jobs and a place to go so the system has room for the next person coming in off the streets. Seattle must work more effectively with landlords to pave the way to get more people in market-rate housing with some temporary government financial help. The region needs to keep ramping up homeless-prevention efforts, which are less expensive and more effective than helping people once they’re on the street. And Seattle and King County need to track data and adjust spending to focus on the most effective solutions that help the most people. One effort where more spending has resulted in better results involves Seattle’s “navigation teams,” which are getting homeless people off the street and into housing. These teams of specially trained police officers and outreach workers have helped a record number of people this year. Preliminary data for 2018 shows navigation teams made more than 7,300 contacts with 1,829 persons this year, resulting in 474 referrals to shelter through the end of July. The city has also worked to create more temporary living places for people leaving unsanctioned camps to come inside. Now the city must work harder on two things: find or create more permanent places for homeless people to live beyond temporary shelter and prevent more people living on the economic edge from becoming homeless. But as Harrell and other government officials have also said, money isn’t the only tool needed to address this complex and seemingly intractable problem. Seattle, King County and the state of Washington also need to apply creativity, tight coordination, careful data and budget tracking and compassion.